What is laser eye surgery in Phoenix like? At Cornea Consultants of Arizona we explain laser surgery, which includes LASIK, to our patients in Phoenix as undergoing a surgical procedure with the use of a laser instead of a scalpel to cut a tissue. When you are looking into having your vision corrected so that you no longer need glasses or contact lenses, we highly recommend having laser eye surgery done. What laser eye surgery does is reshape the cornea to change its focusing function. 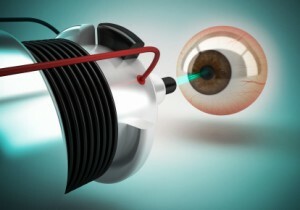 Although there are several types of laser eye surgery, LASIK surgery is the most common procedure. Many patients who have chosen LASIK had 20/20 vision after the procedure was done. Other laser eye surgeries that you can choose from are PRK, LASEK, or epi-LASIK. It is important to consult with your eye doctor to determine which option is best for you and your condition. What is LASIK and PRK surgery? LASIK stands for Laser Assisted In-Situ Keratomileusis. It is a surgical procedure that utilizes a laser to correct near-sightedness, far-sightedness, and even astigmatism. LASIK does not, however, treat or prevent age-related long sight or presbyopia. During a LASIK procedure, numbing drops will be used and the eyelids will be held open so that it will not interfere with the laser. A microkeratome blade or femtosecond laser is used to create a tiny flap in the cornea. Your surgeon will then fold the flap back and remove some corneal tissue using an excimer laser and finishes the procedure by putting the flap back in place. LASIK corrects near-sightedness by flattening corneas that are too steep and the opposite is done for patients with far-sightedness where LASIK corrects it by making the cornea steeper. For patients with astigmatism, LASIK will smooth the irregular cornea into a more normal shape in order to correct it. What are the benefits and risks with laser eye surgery? Our doctors at Cornea Consultants of Arizona in Phoenix always go through a thorough consultation with all of our patients to determine if laser eye surgery is the best option for each patient based on their eye condition as well as their medical history. One of the most common reasons why people opt for laser surgery is because they no longer want to use their glasses or contact lenses and they want their eye sight to be restored to 20/20 vision. The results, of course, will vary depending on the degree of your vision problem as well as the quality of work that your eye doctor does. This procedure also has some risks attached to it, as all surgical procedures. Infection from the flap and other healing problems is possible. It is also possible for the cornea to be under treated or over treated due to its sensitivity. A patient may also suffer from dry eyes after the surgery. In some patients, new visual problems are reported as a complication of the eye surgery. And there are very rare instances that patients have completely lost their vision. So it’s very important to make sure that you are choosing a good eye doctor before deciding on getting this procedure done. The Visian ICL is the next generation of cutting-edge vision technology. Click here to learn more about the Visian ICL.